This is the last of the series showing the original 1963 sales brochures of the William Krisel designed homes of Paradise Palms. Iâ€™m just intelligently guessing that about 300 of the 1044 homes in Paradise Palms were Krisel designs. Irwin Molaskyâ€™s Paradise Development Company developed the entire master planned community, and directly built the Krisel homes. 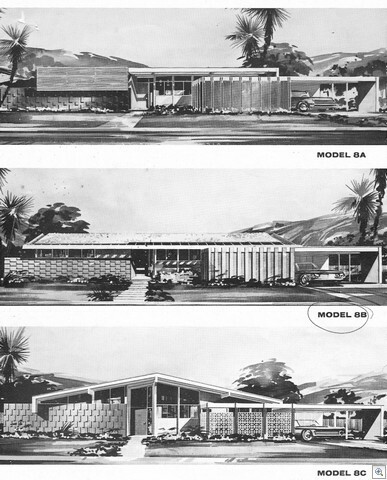 There were other construction companies that built some of the â€œunitsâ€ of Paradise Palms. For example, in the first of the newsletters, we learned that the whole section north of Desert Inn, betweenÂ Camelback RoadÂ andÂ Eastern Ave.Â were built by Miranti Homes. These 83 homes in Unit 11 were concrete block, ranch style homes with pitched roofs or flat roofs, and sunken living rooms. 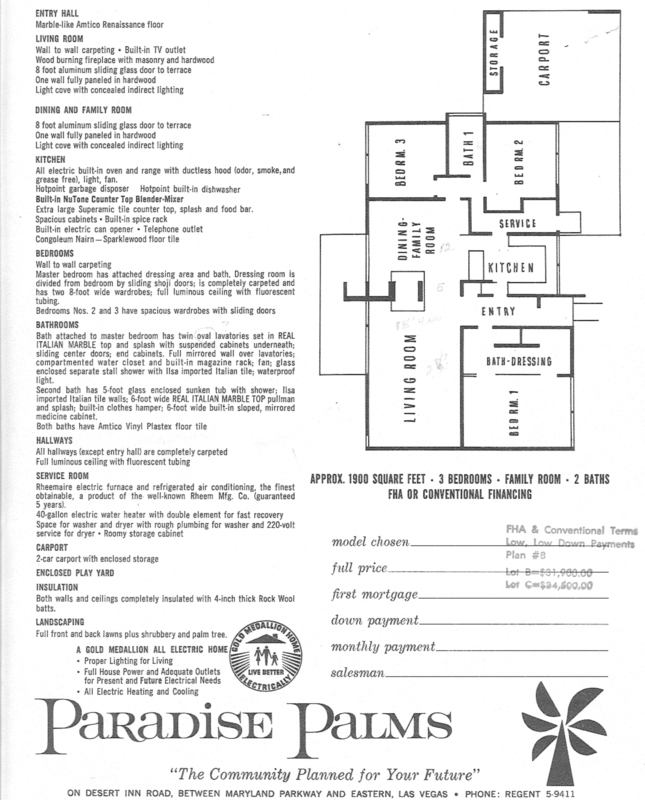 I have no clue if Irwin Molaskyâ€™s Paradise Homes actually built the rest of the homes in his development. If anyone else has a clue or some history for me, please email or call me. Plan 8 was the largest of the Bill Krisel Designs. It was 1900 square feet. The fireplace was the centerpiece of the home as it was an island which served as a divider between the family living room and the dining room. The other distinctive feature was the screened front courtyard in front of the kitchen window, whichÂ stretched over to the carport. I donâ€™t recognize the 8A at all. I donâ€™t recall any that have an extended facia providing shade to the bedroom windows. Nor doÂ I recognize the shadow block design on the left front of the house. Am I wrong? 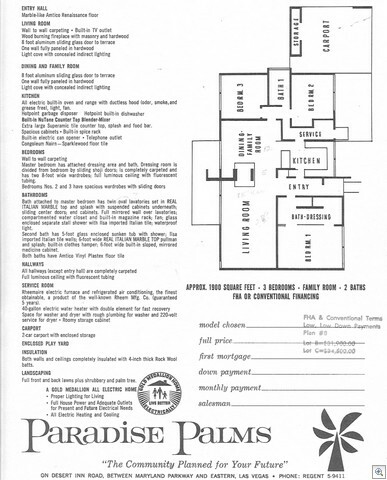 Thereâ€™s at least 3 people/couples that I know of who have been driving around Paradise Palms with these brochures trying to identify all the houses of each model. I wish I had the time to do it lesiurly as well. Perhaps one of them will spot an 8A that Iâ€™m not remembering.